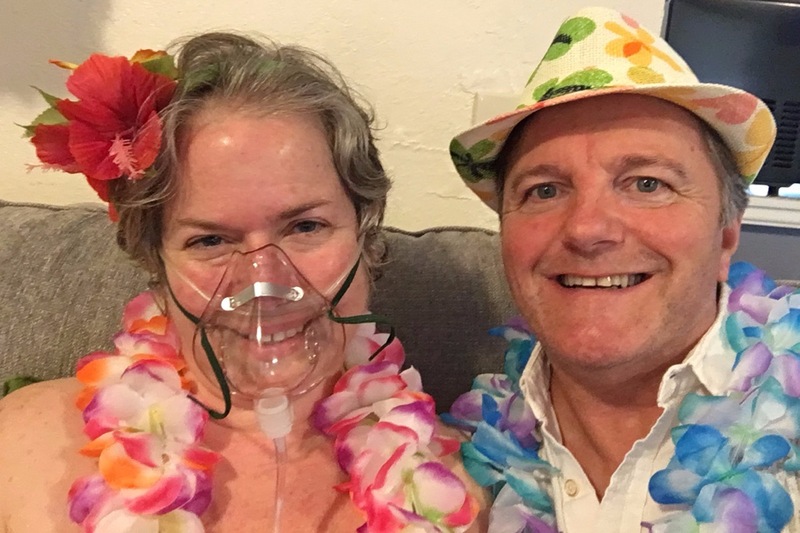 My friend Cherie Beck Harp-Baird, age 53, is dying from IPF (Idiopathic (meaning cause unknown) Pulmonary Fibrosis – (scarring of the lungs)). This is a family of 200 RARE lung diseases for which there is NO CURE. This disease makes it difficult to impossible, for her to take in enough oxygen to keep her body functioning. She is slowly suffocating to death and as her body can’t get oxygen it swells up with fluid threatening congestive heart failure. She is presently on Hospice in Slidell, LA with her husband, Robert. She is in the Acute phase of this disease and is using 17 liters of oxygen per minute (lpm) just to sit on the couch or lie down in bed. Under exertion, (moving from bed to wheel chair, or being moved from bed to table or bathroom, she uses 20+ lpm of oxygen. She is on three large oxygen concentrators to produce the oxygen that she needs. Her dying wish is to be moved back to Dallas, TX and placed on Hospice there, so she can be near her children and grandchildren for the time she has remaining and be tested for a possible lung transplant, which may give her a few more years of life. In order to move her, she requires a highly specialized, Medical Aircraft Ambulance transport. This is extremely costly, we are trying to raise the funds for the air ambulance and to cover any ancillary medical charges and medical equipment costs. This article was posted in Medical and tagged Fibrosis, Idiopathic, Pulmonary, Rare, Terminal.